Tech conferences tend to have no trouble selling booths to startups – the promise of attracting press and investor attention is a major draw. But at the Web Summit in Dublin, where hundreds of companies are vying for attention over three days, actually getting anyone to stop and chat can be a frustrating experience for those who have shelled out their own little spot. I’m as guilty as other media of tending to ignore startup booths – it can be hard to pick out the best teams when I have pre-booked meetings and need to set aside time to write, too. So, today I decided to enter the fray and meet 11 companies, to find out a bit about what they do anyhow they’re tackling the fight for attention. Given the firefighting that the Web Summit recently had to do after being accused of ‘scamming’ startups in the way booths were sold, it seemed particularly worthwhile seeing what they were actually getting out of the event. What do you do? : Realtime group dating. Take a group selfie of you and your friends, and get matched with other groups interested in a joint night out. What’s your Web Summit strategy? : We’ve been running Twitter ads on the Web Summit hashtag to attract investors and also reeling in people as they pass the stand. What do you think of the event? : It’s our first time and the Web Summit. We’re very excited, there’s quite an intense buzz. We didn’t realise the size of it, there’s almost too much to take in – a lot to do in three days. What do you do? : Blocks is a modular smartwatch. You can customize the look and features. It runs a custom version of Android. Think ‘Project Ara for smartwatches.’ There will be phone module so you can leave phone at home. What’s your Web Summit strategy? : We’re not looking for investors; we’ve raised $1.2 million on Kickstarter and the campaign isn’t over yet. We’re just raising awareness for our project amongst the tech community. What do you think of the event? : It’s our first Web Summit. It’s okay but a lot of people just walk past the booth. I’m not sure if startups get enough value from having a stand for one day – everyone is in a rush to see speakers and forgets about the startups. What do you do? : Making finding a job easier with targeted matching of vacancies and jobseekers, using advanced algorithms and providing insights on cost of living and salary levels in their local area. What’s your Web Summit strategy? : We prearranged some meetings with investors but not with the media – we realized we should have done that when we got here. What do you think of the event? : This is our second Web Summit. It’s great except for the usual WiFi and power problems, also they now charge for food. What do you do? : A payments app for the art world with no payment limit – payments through the platform range from $10,000 to $6 million. Users can pay dealers or auction houses directly. Founder Natasha Rottman has a ten year history in art tech. She sold her last startup to Christie’s last year. What’s your Web Summit strategy? : Making people in tech and fintech aware of the service as we already have a high profile in art world. Not many developers know about the art world, and we need to grow our team. What do you think of the event? : So far fantastic. I’m a seasoned pro at art fairs and this is well organised by comparison. I’ve met lots of potential partners. What do you do? : Keep customers and upsell existing customers via a SaaS Web app. Crunches data and identifies future churning customers. What’s your Web Summit strategy? : We have an animation running on a screen at our booth to attract passersby. The founders are in pre-arranged meetings while someone else runs booth. What do you think of the event? 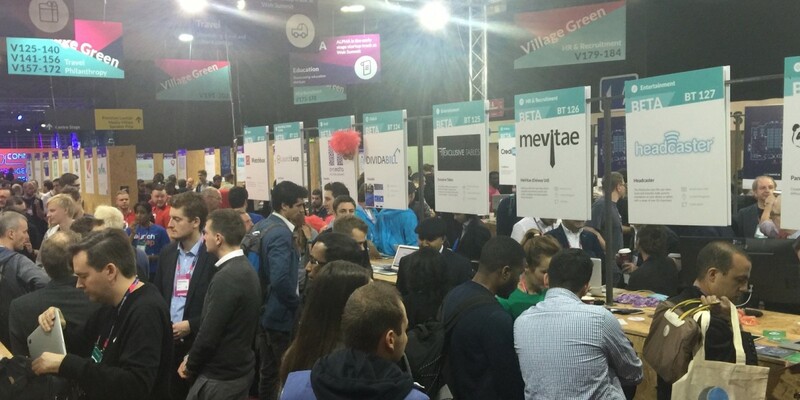 : It’s our first Web Summit, it’s good to see lots of other French startups here. What do you do? : ‘Ridesharing for packages,’ matching availability with things people want to ship. We’re focused on Germany now, and we’ll probably have to pick another name outside our home country to avoid conflict with US startup Shyp. What’s your Web Summit strategy? : We’ve arranged meetings with investors and we’re trying to talk to similar companies that might make good partners to help us grow. What do you think of the event? : It’s our first Web Summit. It’s pretty good but a bit too big. It’s hard to take in all the startups. There’s good networking and the Night Summit (evening meetups in bars) is good. What do you think of the event? : It’s our first Web Summit. It’s well organised with lots of good startups and speakers. What do you do? : Like a better version of Geek Squad but for Germany. With the growth of the connected home there are lots of opportunities for personal tech support to help. A person comes to your home to fix tech, help you learn new things and recommend products. We started in Cologne, where we now have 15 tech consultants and we’re expanding to other German cities. What’s your Web Summit strategy? : We used the conference app to see who was coming, and contacted investors through the app but didn’t get many responses. We’ve seen around a 10 percent response rate to our messages. What do you think of the event? : It’s our first Web Summit. It’s huge – you barely see the same person twice, which makes it difficult to plan networking. You have to rely more on random meetings. What do you do? : We’re a platform for helping bricks-and-mortar stores to compete with online shopping. It highlights local offers to users, relevant to their tastes. Users get an extra discount for sharing an offer with others. What’s your Web Summit strategy? : We’re here to get feedback and look for investors. We’re engaging with people as they pass the booth and have booked meetings through the app with investors and potential partners. What do you think of the event? : It’s very good, with lots of people to meet. I met a machine learning specialist at the bus station in Dublin yesterday and have a very interesting chat. What do you do? : We’re the ‘new Flipboard.’ Our app includes mobile commerce features and games, immersive advertising. What’s your Web Summit strategy? : We want to find partners to grow the product further – investors or corporations. We’re stopping people as they walk past – I believe the best strategy is to be yourself. I don’t like to make a big noise, I’ll let the product speak for itself. What do you think of the event? : It’s well organized but the application process for startups was messy and they could do more to connect startups with relevant press and investors. What do you do? : We want to be number one recruitment platform for startups. We make it easy for startups to find the right candidate for their vacancy. We have 15 staff and now have 800 companies on our platform, including Google, Delivery Hero, Runtastic, Amazon and Dubsmash. What’s your Web Summit strategy? : We have a ‘Superman’ to attract attention to our stand. We have one person targeting startups to sign them up to the platform, one person at booth and our team in Berlin is publishing content from the event on our social media channels. What do you think of the event? : It’s our first Web Summit. We’ve got more exposure here compared to similar events in Germany.